Blurb Ithaqua needs to be stopped! it is based on the post spring-release CVS of sauerbraten and will not work with the spring release! I'm including a rather make-shift skybox texture - feel free to adapt and improve on it and send it to me to include in the next update (of course you'll get credit!). The ZIP also includes a few extra textures I needed and a model (with variations on the skin) originally made by geartrooper and enhanced by makkE - thanks guys! (also for your beta-testing and constructive criticism). unpack the ZIP to your sauebraten CVS installation folder - nothing will be overwritten! 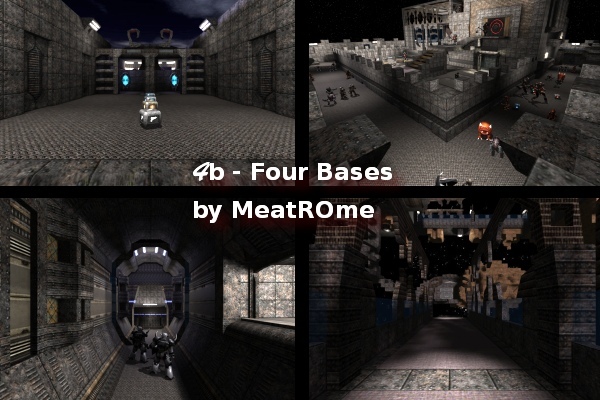 start playing by entering "sp 4b/0" ... preferrably directly after "skill 10"
Those of you that have played "sp bbb" from any of the last couple of Sauerbraten releases will recognize quite a bit of geometry ;) ... I promise, the next SP campaign - I'm currently already dreaming up - will have a new (and more elaborate style) ... but there's quite a bit of work that went into revamping the most bland bits and I definitely think you'll enjoy all the scripting aspects I've put in - feel free to adapt those to your own work! I'd try it, but it locks up my computer when it gets to "generating environment maps". TBH I had that about two weeks ago myself, but my box was running for ages already and I'd been starting and shutting down Sauerbraten quite a number of times just before it happened. Anyway - CVS src seems to be a bit unstable ATM ... yesterday RPG module wouldn't start for me, but was fine again after a fresh update from CVS ... all beta-testers could run them no trouble, geartrooper tried it yesterday to try to confirm your finding - it worked for him - please try again. Will do, but I doubt it'll go away. Same thing happens on a few other maps. EDIT: Nope. Still happens. If it's any help, it happens on vr, too. Very entertaining. Mood promoting. Hackle raising. Baffling puzzles. I think you did a good job. echo " 5forgotten 1 something?"